Cynthia sits outside Wilder Tower after a hike with her family. Chattanooga built railroads in the 1850s, and during the Civil War, Union generals targeted the city. Moving troops by rail lines would make it easier to split the South in half. While the Union artillery shelled the city in June 1862, the big campaign to occupy began in August of 1863 when Union General Rosecrans headed his troops toward the city. Confederate General Bragg pulled his men out of Chattanooga, leaving troops on Lookout Moutain and Missionary Ridge. The Battle of Chickamauga took place on September 19 – 20, 1863, killing 35,000 men. The Confederate victory became one of the last. 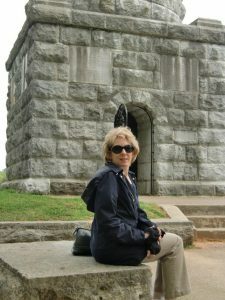 Cynthia grew up in Chattanooga a few miles from Chickamauga Battlefield National Park. She spent many hours there with her family crawling on the cannons, riding bikes, and having picnics. The Museum became a familiar spot too. She’d peer at the tattered uniforms and try to imagine men who wore them. Her father, C.L Thomas, was an expert on weapons used during the war. He often explained the process of rifling the barrels, which made the guns more accurate. When Cynthia and homeschooled her children studied the Civil War, she asked her father to teach about the guns and artillery used at the time. Mr. Thomas displayed his black powder gun, which was an accurate replica, and showed a sample of black powder which he sat on fire. The children experienced the heavy, acrid smoke which soldiers endured. 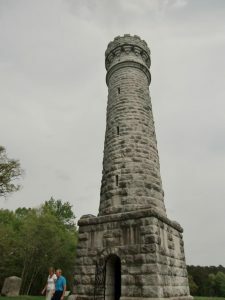 Cynthia’s husband, Ray Simmons, planned to propose to her at Wilder Tower which marks a major conflict during the Chickamauga campaign. Since park officials close the tower at night, the couple had to leave before Ray summoned up the courage to pop the question. Rugged and steep, Lookout Moutain created a safe place for the Confederates. Union troops stormed up in November of 1863. Historians later called it the ‘Battle Above the Clouds’ because of the height soldiers must scale. Point Park now marks the site of the battle. 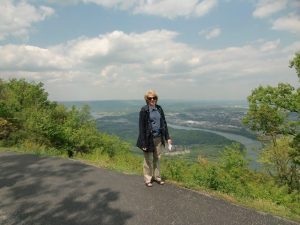 From that vantage point, a person can see Chattanooga in the valley below. Cynthia also enjoyed family outings here.